It’s rather uncanny that the garment in a gentleman’s wardrobe that reveals the most about his style progress is the ubiquitous denim jean. As a teen youth, he may have worn them wild and ripped; covered in beer spilled from plastic cups at one of the many gigs he attended. As a young early-twenty-something, he may have ‘upgraded’ to the bootcut style, with the carelessly frayed bottoms, to be worn with his overcoat when at university. He may have discarded the unkempt look entirely by his mid twenties and realised that dishevelled denim was for poor students and protestors and was not the sort of thing a trainee accountant should be wearing as he advances towards the psychologically important age of thirty years of age. His weekend look might be something like a straight-leg, dark denim, ever so slightly washed, worn high, just kissing the tassels of his oxblood loafers. I once looked through the ghastly graveyard of my denim collection and was shocked by the number and style of the purged; it’s humbling how following fashion so closely can result in such a quantity of uselessness. Like that moment experienced by most young people when they think over folly, realising that their parents had been right all along. Beyond the straight-leg dark denim of our hypothetical trainee accountant, it is considered that there is no denim of appropriate elegance for our gentleman of style. The ferociously anti-denim forum writers and followers of dandy purism often refuse to acknowledge denim as clothing; indeed there may be many readers of these columns who deem jeans to be beneath a gentleman’s consideration. There is something compelling in their argument that simply because a garment happens to be popular, it does not mean that a man of singular and self-determined style need be troubled with it. However, I find it difficult to reject denim entirely. And it has nothing to do with denim’s dominance in the market of casual clothing. It has a work-a-day quality that contrasts with the finesse of tailoring, which I like. It is hard wearing and, though its comfort is overrated, in denim you do not feel particularly precious in the midst of some of the more sartorially unfriendly activities of modern life. Linen is comparable to it in this respect. 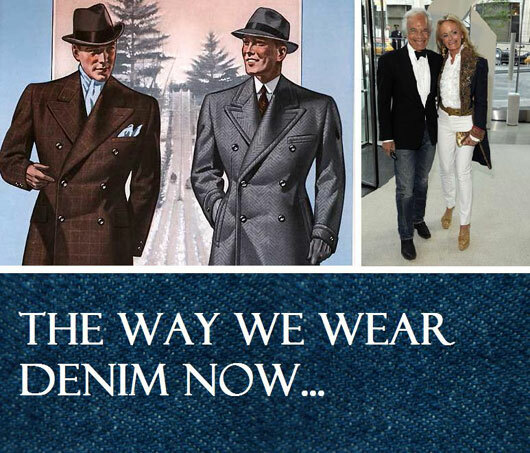 The problem for a gentleman who is cultivating a wardrobe of waistcoats, blazers, bow ties and smart shoes is finding the right denim to complement such elegance. It seems to me there are two routes to take; the gentleman in question could approach the denim question in search of an exaggerated contrast or, he could opt for a denim of classic camouflage. I use both approaches. Sometimes I will wear a pair of washed skinny jeans with some loafers, an odd jacket and a shirt and tie – I like the aesthetic contrast between the materials; my lower half is exaggeratedly contemporary whereas my upper half is arguably inter-war. On other occasions, I will slip on a pair of straight leg dark and unwashed (non-raw) jeans that masquerade as blue trousers. This look forms a more classic silhouette that is recommended for lovers of the classical. The reason why this look works is because of the way denim works as a fabric; a slight bunching or creasing around the knees is not unwanted or unattractive, whereas on a pair of cotton or wool trousers it would be. Trousers are required to be crisply pressed whereas denim looks far better when it is un-ironed. It is for this reason that denim is such an excellent lifestyle material. There is at least “senior member” on Style Forum who boasts of never having worn denim. Pity for him.